Freedom to Learn. . . Learning to be Free! Detox Plus UK is a national helpline for people experiencing difficulties with drug and alcohol addiction. Each year, we receive thousands of calls from students experiencing issues with addiction. For this reason, we have decided to pull together our knowledge in this field by offering this guide specifically for student drug abuse. Student life for many young adults is their first true opportunity to become independent, experience life and become responsible for themselves. In addition to their chosen programme of study, this new found sense of freedom brings with it many new responsibilities. Many students will live away from the family home for the first time, will have part-time jobs to support their studies and will begin new personal and professional relationships. Undoubtedly all will encounter a wide range of new people, new experiences and new situations. Most new experiences will be beneficial and character forming; however some, involving the temptation to experiment with drugs and alcohol will exist. Become prepared to make better choices by informing yourself and learn to be free of the dangers of alcohol and drug abuse and understand the true facts about addictive substances. Do young people and students, in general, get a bad rep over alcohol and drug consumption? Unfortunately for many students, they are unable to control their drinking habit or drug use, and this often leads to student drug abuse and addiction. Alcohol is the most commonly abused drug among students and makes up the vast majority of student drug abuse problems on campus. Due to the social acceptance of alcohol consumption, it may be difficult to recognise students with a drinking problem. Alcohol is by far, the easiest, most accessible, legal drug available and the one drug that damages society the most. Available everywhere and sold cheaply, at a discounted and subsidised rate, on campus in student unions and student bars throughout the UK. With the ready availability of cheap alcohol in social settings like student unions and student bars, it is socially acceptable for students to get drunk while out with friends. In reality, many students do not drink every night, and therefore they don’t see any harm in it. However, it can come with significant risks, especially binge drinking. Students that frequently drink are more likely to experience an increased chance of alcohol addiction, changes in brain development, memory issues, higher risk of suicide, higher risk of assault and possible alcoholic poisoning. Are you worried about how much alcohol you are drinking? Do you even know how much alcohol you are drinking? Discover what your relationship with alcohol is! You may be in control, but what if you’re drinking too much and need to take action? Use our quick and simple calculator tool to gauge your consumption level and understand more about the impact of your drinking on your health and wellbeing. Think about your drinking behaviour over the last 12 months and choose the closest answer that applies to you for each of the categories of alcohols below. All drugs, legal and illegal, are classified into different types dependant on the current legislation of law. The best way to stay safe amidst the student alcohol and drug culture is to educate yourself – understand the class of drugs commonly available on campus and learn about the harmful effects of substance abuse and addiction. Cannabis is also known as Marijuana, Grass, Weed, Hash, Pot, Dope, Ganjha, Smoke, Reefer, Skunk, Solid, Soapbar and Resin. Available in many different formats including as a solid lump or resin, as leaves, stalks and seeds called grass or as a sticky dark semi-fluid called oil. ‘Cannabis is the most frequently taken drug by students, having been used at some point by 94 per cent of respondents to the survey, who said that they had used drugs. Cannabis was also the only drug that was more likely to be used regularly, rather than on special occasions’. Cannabis is a Class B drug, making it illegal to have, give away or sell. Cannabis possession can get you up to five years in prison and/or an unlimited fine. Supplying someone else with Cannabis, even your friends can get you up to fourteen years in prison and/or an unlimited fine. The risks of cannabis abuse include short term effects like tiredness, lack of motivation and impaired abilities to concentrate and complete tasks. The long term effects of regular use can lead to the development or increase in mental health issues including paranoia. Cannabis use can also cause heart and breathing problems, and heavy use can lead to withdrawal symptoms. Ecstasy is also known as Eckies, E, X, MDMA, Mandy, Pills, Sweeties and many other names. Available in tablet form with differing shapes, sizes and colours that may have a logo or design stamped onto it. Also as a crystal powder form, it is often called by its chemical name of MDMA. Often viewed as a ‘party drug’, ecstasy is extremely popular on campus, most common at raves and concerts. Ecstasy is frequently mixed with other drugs, like amphetamines, alcohol or caffeine to produce a stronger, more potent and dangerous high. Ecstasy is the second most commonly used drug by students, having been taken by two thirds (67 per cent) of NUS respondents who have used drugs. Ecstasy is a Class A drug making it illegal to possess, give away or sell. Possessing it can lead to a prison sentence of up to 7 years and/or an unlimited fine. Supplying someone else with Ecstasy, even your friends could lead to a life sentence and/or an unlimited fine. Ecstasy and MDMA type drugs are known to produce a boost of energy and a euphoric high. However, they are also highly addictive and can cause hallucinations, paranoia, anxiety and other mental health problems. Using Ecstasy has been linked to liver, kidney and brain damage. Other side effects can be very severe and include dehydration, increased heart rate and increased body temperature. 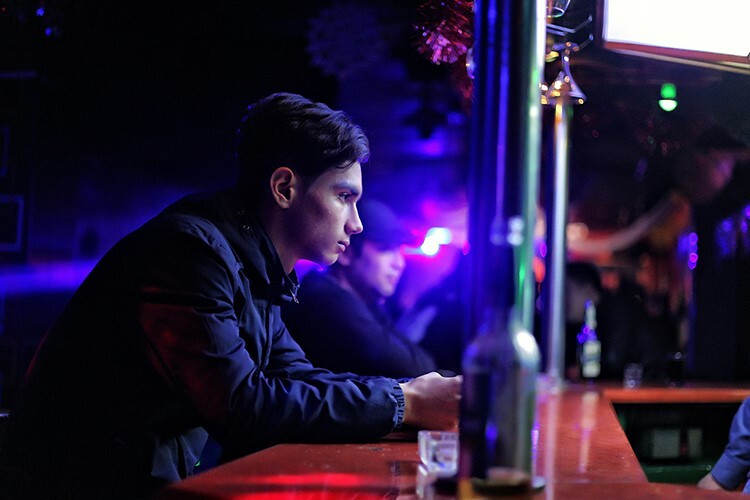 Users often feel ‘down’ or tired and low for a few days after taking ecstasy. A danger also exists in not knowing what is actually in the pill or powder or how your body will react to it. While only a small number of deaths have been reported due to Ecstasy, the popularity of the drug is high among students. 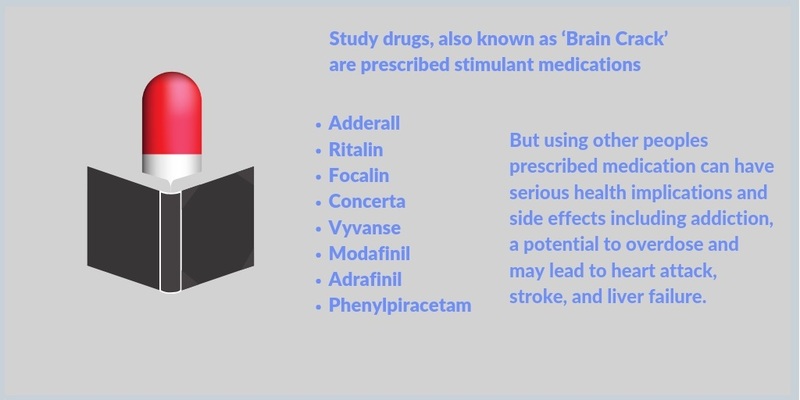 Study drugs like Ritalin, Adderall, Focalin, Concerta are legally prescribed by doctors to treat attention deficit hyperactivity disorder (ADHD) and many other disorders in children and adults. They are a combination of two stimulant drugs – amphetamine and dextroamphetamine and are types of nootropics – prescribed medications that are designed to help enhance cognitive functioning. Modafinil is a medication used to treat sleepiness due to narcolepsy a press release by Nottingham University found that healthy students could find their performance impaired by the drug. According to the latest NUS Drug Survey six per cent of respondents who have used drugs said that they use ‘study drugs’ at least once a month and one in five of this same group have taken them at some point. Overall one in ten of all students responding to the NUS survey have ever taken study drugs. Study drugs are taken to improve concentration, energy levels, physical stamina and motivation. These drugs are increasing in popularity among students looking to boost physical and mental performance who are facing pressure to fulfil all of their academic responsibilities. Students obtain study drugs by ordering them online or from fellow students who are prescribed these drugs. 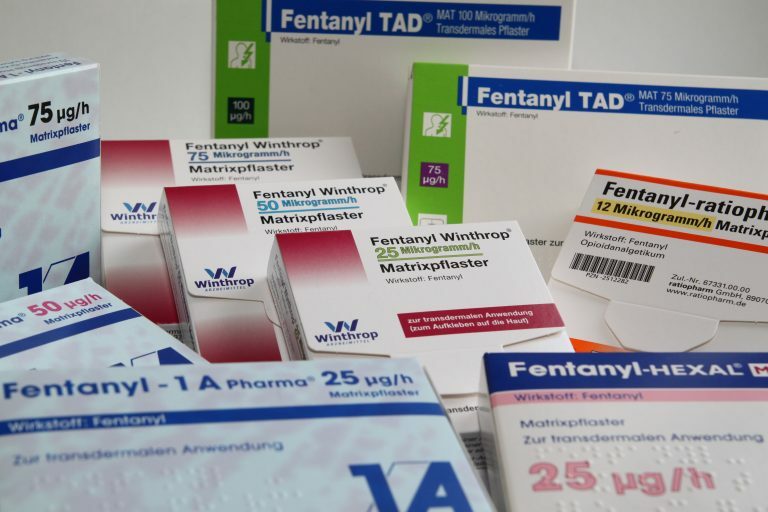 Using other peoples prescribed medication is extremely dangerous and can have serious health implications and side effects including addiction, a potential to overdose and may lead to heart attack, stroke, and liver failure. Instead of taking drugs, exercise or resting might be a better idea. Especially if done on a regular basis. Sleep can also improve brain power, even if you are not tired. It has particular positive effects on memory but can also increase creativity. Even naps as short as six minutes during daytime can improve memory. Cocaine is also known as Coke, Charlie, Chico, Snow, Fairy Dust, Freebase, Rock, Crack and many other names. Coke is a white powder, and Crack is a form made into small lumps or rocks that make a cracking noise when burnt and Freebase Cocaine is a specially prepared version of Cocaine and is a crystal-like powder. They are powerful stimulants that temporarily speed up the way your mind and body work. However, the effects are short-lived. Taking cocaine increases confidence boosts tiredness and makes the user feel a false sense of greatness. However, many users become overconfident and therefore take very careless risks. Cocaine and Crack Cocaine are both Class A drugs making it illegal to have, give away or sell. Possessing Cocaine or Crack can lead to a prison sentence of up to 7 years and/or an unlimited fine. Supplying someone else with Cocaine or Crack, even your friends could lead to a life sentence and/or an unlimited fine. Cocaine artificially stimulates the brain by producing high levels of dopamine and provides false pleasure and reward signals. It has the potential for short and severe long-term effects. It can cause genetic changes in brain cells and nerve cells causing permanent effects. Around 1 in 5 (19.8%) adults aged 16 to 24 had taken a drug in the last year. This proportion was more than double that of the wider age group of 16-59 and equated to around 1.2 million people. Stress – Student life is a busy life with the high demands of coursework, part-time employment to support studies, extracurricular activities, social and personal obligations and many other demands. These factors mixed with the fear of failure lead to high demands that can push students to turn to drugs as a way of coping with stress and manage their responsibilities. Coursework – More students are taking stimulants, such as Adderall, to help them focus, stay alert and have the stamina to study or complete assignments by their due dates. Curiosity and experimentation – It is often for the first time as students that many young adults get a taste of freedom and responsibility. They are discovering many new aspects of their student lives in personal and social situations. It is not uncommon for that self-exploration to delve into drug experimentation as students want to experience drugs and alcohol for themselves. Peer and social pressure – Students embarking on college life are just beginning to get to know themselves and develop their character. The desire to fit in with a particular crowd makes new students extremely susceptible to peer pressure. Students surrounded by other people experimenting with recreational and performance-enhancing drugs are more likely to try these substances for themselves. Confidence & Social Anxiety: Making social, professional and personal connections in any new environment can be daunting for people who are naturally shyer or reserved. Using drugs or alcohol may temporarily calm the nerves, boost confidence and portray the ‘fun’ side of your personality; however, it can easily turn to addiction. Substance abuse can be attributed to any one of these factors. However, it is more often than not a combination of reasons that lead students to abuse drugs and alcohol. Recreational purposes – Eight in ten (80 per cent). Help deal with stress – one-third (31 per cent). Lesser commonly cited reasons for respondents using drugs were to improve their confidence and to cope with a difficult life event. To learn how Detox Plus UK can assist you or your loved one through an addiction to drugs or alcohol, contact our team today on 02072052734. Each year, Detox Plus UK helps thousands of students and their families in locating addiction treatment that’s right for their needs. 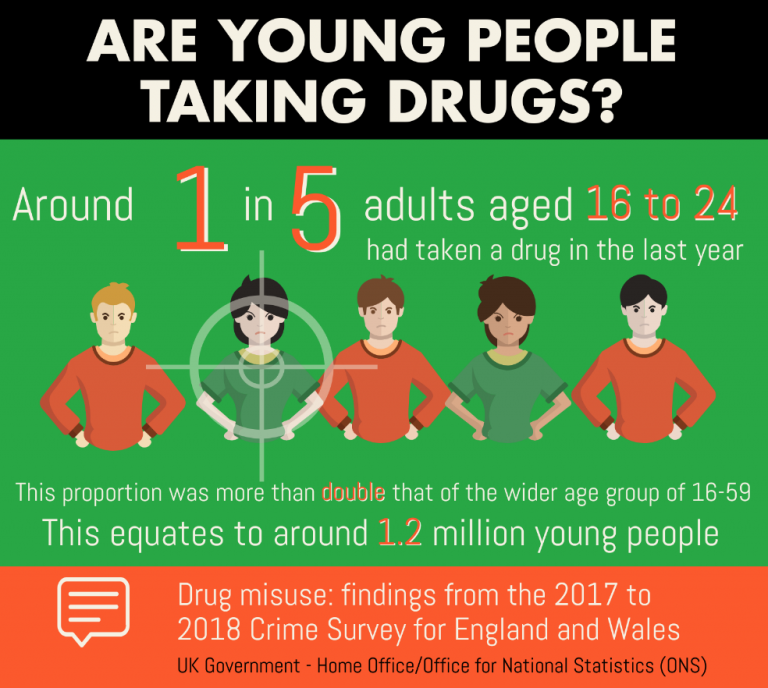 What percentage of young adults (aged 16 to 24) had taken a drug in the last year? What is a symptom of alcohol poisoning? Passing out and being unconscious. Being in a stupor, that is being conscious but unresponsive. Synthetic cannabinoids, also known as ‘fake weed’ with names like Spice and Mamba are extremely dangerous because? Synthetic cannabinoids are a type of new psychoactive substance, developed to have similar effects to the psychoactive substances found within cannabis. Sold under a number of street names including Spice and Mamba, synthetic cannabinoids have skunk marijuana like qualities but are extremely more potent. There is increasing health concern about the impact of these new substances on the physical and mental health of users. It is much more likely to cause distortions in reality, hallucinations and delirium. Other known side effects of the drug include breathing difficulties, stupor, dehydration, vomiting, severe rashes and loss of control over parts of the body. The long term effects are as yet unknown due to the recent introduction of these substances. The Psychoactive Substances Act 2016 came into force on May 2016 and applies across the UK and bans the sale, supply, and import of psychoactive substances (previously known as “legal highs”) in the UK. Having an alcohol or drug addiction and another mental health issue at the same time (for instance anxiety or depression) is classified as a co-occurring condition. All co-occurring conditions should be treated, but it is best to? The brain is especially susceptible to damage from alcohol while it is still in the development stage. Until about what age does the brain continue to develop? The top illegal drug substances that are currently being used among students are Cannabis, Ecstasy and Study Drugs. What fraction of students report that they intentionally use Study Drugs? 6% Study drugs are taken to improve concentration, energy levels, physical stamina and motivation. These drugs are increasing in popularity among students looking to boost physical and mental performance who are facing pressure to fulfil all of their academic responsibilities. According to the latest NUS Drug Survey six per cent of respondents who have used drugs said that they use ‘study drugs’ at least once a month and one in five of this same group have taken them at some point. 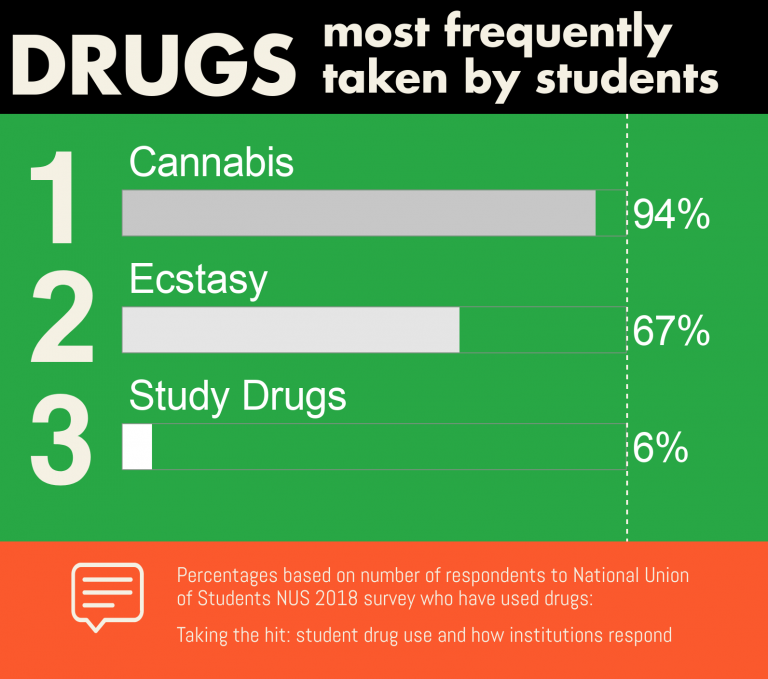 Overall one in ten of all students responding to the NUS survey have ever taken study drugs. Read more here: Taking the hit: student drug use and how institutions respond. Electronic vaping devices like e-cigarettes can help stop teenagers and young adults from smoking real cigarettes. Cannabinoids are the chemical ingredients in Cannabis and Marijuana. What is the name of the main ingredient that makes you high? A danger exists in not knowing what is actually in the pill or powder or how your body will react. It can cause hallucinations, paranoia, anxiety and other mental health problems. It interferes with how your system regulates body temperature, which can result in heart failure or even death. Its use has been linked to liver, kidney and brain damage. All of the above. Ecstasy and MDMA type drugs are known to produce a boost of energy and a euphoric high. However, they are also highly addictive and can cause hallucinations, paranoia, anxiety and other mental health problems. Using Ecstasy has been linked to liver, kidney and brain damage. Other side effects can be very severe and include dehydration, increased heart rate and increased body temperature. 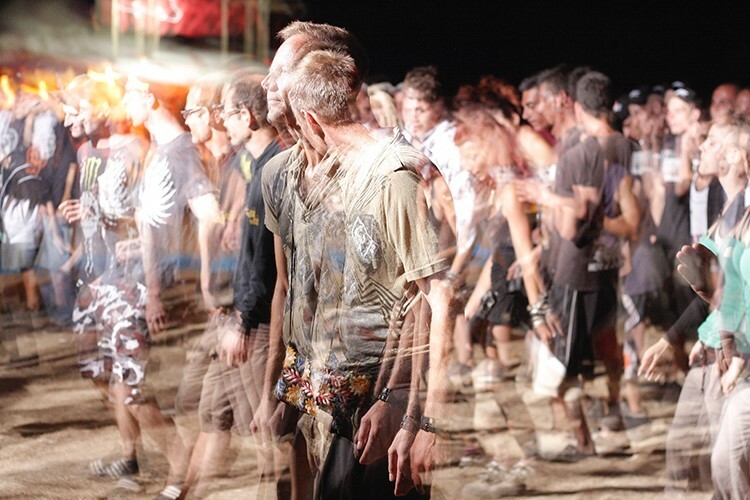 Users often feel ‘down’ or tired and low for a few days after taking ecstasy. A danger also exists in not knowing what is actually in the pill or powder or how your body will react to it. While only a small number of deaths have been reported due to Ecstasy, the popularity of the drug is high among students. Ecstasy is the second most commonly used drug by students, having been taken by two thirds (67 per cent) of NUS respondents who have used drugs. Read more here: Taking the hit: student drug use and how institutions respond. Did you expect these results? Share the test with your friends to see how well they're informed. Different medications are used to treat different withdrawal symptoms. Some of the drugs that are prescribed in detox include: Benzodiazepines- These drugs reduce anxiety and irritability. Anxiety is a common symptom of withdrawal from many drugs, including cocaine and opiates like heroin. Benzos have a sedative effect, which helps ease alcohol withdrawals. Doctors are cautious about prescribing benzos because they are addictive. Antidepressants- Without drugs, an addicted person cannot produce natural amounts of happiness-inducing chemicals in their brain. Because they’ve relied on drugs to keep them happy for so long, people in detox often experience depression. Antidepressants like Zoloft and Prozac can help relieve these feelings until the brain is able to produce happiness-inducing chemicals on its own again.